In this weeks BILL MOYERS JOURNAL, Rose Ann Demaro, the Executive Director of the California Nurses Association, argued that calling America's approach to health care a "system" is innaccurate. If you look at health care in America, there is no health care "system." There's a health care industry thats major objective is profit-making  which means not providing the patient all of the care that they need, discharging patients early, patients without insurance being treated differently than wealthy people, frankly. And that is the health care "system" in America. Those who can afford it get to live and those who can't suffer needlessly. The leading cause of personal bankruptcy in the United States is unpaid medical bills. Half of the uninsured owe money to hospitals, and a third are being pursued by collection agencies. Children without health insurance are less likely to receive medical attention for serious injuries, for recurrent ear infections, or for asthma. Lung-cancer patients without insurance are less likely to receive surgery, chemotherapy, or radiation treatment. Heart-attack victims without health insurance are less likely to receive angioplasty. People with pneumonia who don't have health insurance are less likely to receive X rays or consultations. The death rate in any given year for someone without health insurance is twenty-five per cent higher than for someone with insurance. Because the uninsured are sicker than the rest of us, they can't get better jobs, and because they can't get better jobs they can't afford health insurance, and because they can't afford health insurance they get even sicker. 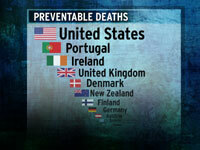 A recent Urban Institute study attributes as many as 20,000 deaths in the United States each year to lack of health insurance coverage and another study, conducted by Ellen Nolte and Martin McKee at the London School of Hygiene and Tropical Medicine, found that the United States leads nineteen top industrialized nations in overall preventable deaths, with 109.7 deaths for 100,000 people (between 75,000 and 100,000 deaths annually). [T]he real health care debate has been delayed by the focus in the primaries on the differences on health between candidates in each party, especially the differences between the plans put forward by the leading Democratic candidates. While the differences between the candidates' plans can mean a lot to experts, they mean much less to voters. Both Democrats cite guaranteeing universal or near-universal insurance as being the end goal. McCain, in adopting a plan similar to Bush's, focuses more on bringing down the cost of insurance for those who want to purchase it. The Democratic plans seek to build on the existing employer-based system, whereas McCain's plan restructures tax laws to encourage individuals to purchase insurance on the open market. McCain's plan favors high-deductibles on the front-end (routine medical visits, vaccinations, et cetera) with catastrophic coverage on the back-end, and using tax-favored savings accounts to pay for routine care, whereas Obama and Clinton's plans are more comprehensive with front-end protection and a focus on preventative care. >>Learn more about the presidential candidates's health care plans. The patient's history and prognosis were grim: four heart attacks, quadruple bypass surgery, angioplasty, an implanted defibrillator and now an emergency procedure to treat an irregular heartbeat. For millions of Americans this would be a death sentence. For millions of Americans, this might be a death sentence. For the vice president, it was just another medical treatment. And it cost him very little. The CNA argues that all Americans should be covered under a similar, government administered plan, and is backing HR 676  commonly known as the "Medicare-for-All Act"  to expand and modify Medicare. This type of plan, in which one non-profit organization pays all medical bills, is often called "single payer." Proponents of a single payer system argue that by putting everyone into one big pool, a non-profit plan can achieve the three benefits enummerated above as well as cut down on administrative costs, balance risk and ultimately cost less than what they refer to as the United States current "corporate bureaucracy". The CNA summarizes their arguments for a single payer system here. Critics of single payer plans often dislike increasing government involvement and point to shortcomings in national health care systems in other nations, such as Canada and Britain, arguing that a single payer system in the United States would lead to long waits and reduced care, extravagant costs and loss of liberty. The Heritage Foundation has a report arguing against instituting a single payer program here. 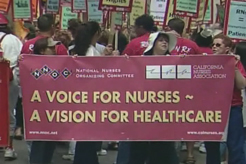 The California Nurses Association and its national arm, the National Nurses Organizing Committee, is one the fastest growing health care organizations in the United States, with 80,000 members in 50 states. They represent nurses in collective bargaining agreements as well as advocate for health care policy reforms such as a federal single payer system for the United States and requiring minimum RN-to-patient ratios. Published May 9, 2008. The U.S. Census bureau's official statistics on health insurance coverage in the United States. The FEHB Program covers over 4 million Federal employees, retirees and family members. The president, vice president, and members of Congress are all eligible. Official site of the Robert Wood Johnson Foundation project. "Cheney Has Another Heart Problem"
by John D. McKinnon, the WALL STREET JOURNAL. November 26, 2007. The California Nurses Association Web site associated with the CheneyCare campaign collects stories of patients denied care by health insurance companies. More information on the 17-year-old who died awaiting a liver transplant initially denied by the health insurance corporation CIGNA. Official Web site of the California Nurses Association. Malcolm Gladwell takes on one the most influential arguments in the health care debate. A summary of the debate over S-CHIP, a program that provides health insurance the children of America's poor. Drew Altman, the president and CEO of the Kaiser Family Foundation writes about the general differences between the Democratic and Republican approaches to health care reform.